The Fiscal Responsibility Act 2012 established the Irish Fiscal Advisory Council (“the Council”) as an independent state body. This, our second Strategic Plan, is about looking forward. It sets out our mission, vision, values, and goals. It presents our three-year plan to strengthen our role in assessing macroeconomic and budgetary forecasts, monitoring compliance with Irish and EU fiscal rules, and advising on fiscal policy. It also describes how we plan to further develop our capacity in relation to each element of our mandate. Strengthening Ireland’s fiscal framework is an important, positive legacy of the economic crisis and one which the Government has committed to respecting. Successive governments have achieved significant progress in resolving the crisis. Ireland saw its deficit fall below 3 per cent in 2015, and so graduated from the Corrective Arm of the EU’s Stability and Growth Pact. As a result, the Preventive Arm of the EU’s Stability and Growth Pact—as well as the domestic Budgetary Rule—applied to Ireland in 2016. However, the Government’s medium-term fiscal strategy of “balancing the books” faces new challenges, such as the post-exit economic relationship between Ireland and the UK. The fiscal rules can help prevent governments repeating policy mistakes that contributed to economic crises in recent decades. An independent fiscal “watchdog” can be a key component of a country’s fiscal architecture. The Council will prioritise delivering on each element of our mandate as set out in the Fiscal Responsibility Acts 2012 and 2013, to support sustainable economic growth. I feel confident that the Council and its Secretariat will ensure that we fulfil our important role. The Council’s mission is to support the effectiveness of fiscal policy in the near- and medium-term through delivery on each element of its mandate as an independent fiscal institution. The Council’s vision is for an economy with broadly based growth in incomes and employment founded on sustainable macroeconomic and fiscal policies. The Council has four legally mandated functions. The first three were assigned in the Fiscal Responsibility Act 2012 . The fourth function (endorsement) was assigned to the Council in July 2013 . To assess the official forecasts produced by the Department of Finance and published in the Stability Programme and in the Budget. To assess the fiscal stance of Government, and specifically whether it is conducive to prudent economic and budgetary management, with reference to the EU Stability and Growth Pact. To monitor and assess compliance with the Budgetary Rule . To endorse the official macroeconomic forecasts prepared by the Department of Finance in relation to each Budget and Stability Programme. This follows revised European requirements to have national medium-term fiscal plans and draft budgets based on independent macroeconomic forecasts, which means macroeconomic forecasts produced or endorsed by an independent body. A joint Memorandum of Understanding between the Council and the Department of Finance underpins the endorsement process . The Council produces biannual Fiscal Assessment Reports, as well as an annual Pre-Budget Statement. Reports are submitted to the Minister for Finance and subsequently published within ten days. The Council lays its Annual Reports before each House of the Oireachtas. The Council chairperson may also be required to appear before the Oireachtas in relation to its activities. In relation to the endorsement function, the Council is required to provide a formal letter to the Secretary General of the Department of Finance at least five working days before the Department publishes the Budget and Stability Programme . If the Council were to conclude that it had significant reservations about the preliminary or “provisional final” macroeconomic forecasts, it would immediately communicate these informally to the Department. If, following further discussions, the Council were still not in a position to endorse the macroeconomic forecasts underlying the Budget or SPU, the Chair would write to the Secretary General explaining why this was the case, at least five working days before the Department publishes the Budget or SPU. 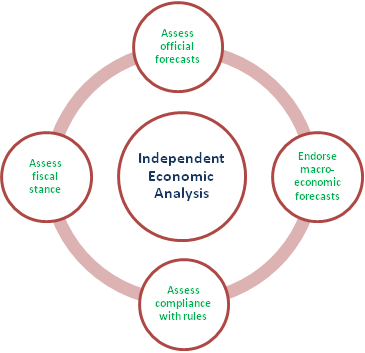 To support the Council’s delivery of its mandate, the Council also produces ad hoc reports including Analytical Notes, Working Papers and other analytical work on the Irish economy, macroeconomic forecasting, and fiscal policy, in addition to an annual Ex-Post Assessment of Compliance with the Domestic Budgetary Rule (the first of which is to be published in 2017). The Minister for Finance appointed the Council’s five members based on their experience and competence in domestic and international macroeconomic and fiscal matters. The current Council has a strong international dimension with three members based outside of Ireland. The Secretariat’s full complement of staff is a Chief Economist, two Economists, two Research Assistants, and an Administrator. Visibility: The Council needs to ensure awareness of its mandate and assessments, which cover key government decisions, in a crowded field of public debate, while ensuring that credibility is maintained. Administrative burden: Achieving all elements of mandate and expanding on Council’s analytical output is a challenge, given the small size of the Secretariat. Progress in relation to the development of more robust analysis of long-term fiscal projections and of fiscal risks is a resource-intensive process. Data/informational asymmetries: Government departments may have an informational advantage. Difficulties with interpretation of Irish national accounts: Difficulties with the interpretation of Irish national accounts, and the link between measures and rules, could prove to be a challenge. Capacity: Small size and defined resources (linked to Harmonised Index of Consumer Prices) mean ability to respond to changing circumstances or new analytical requirements may be constrained. Small size of Secretariat: Council is at risk if staff were to suddenly leave or to take periods of extended absence as there is limited scope for duplication of skill sets resulting in reliance on key personnel. Impact: Changing economic fortunes, political changes, or developments in the EU and Irish institutional framework could limit the ability of the Council to contribute to prudent and sustainable fiscal policy. Independence: Although the Council’s independence is underpinned by legislation, there could be moves to reduce current protections in the future. Cooperation: The Council is highly reliant on information from government departments and agencies, which is provided by goodwill rather than formal information-sharing arrangements. If this goodwill were to diminish, access to information could become more constrained. Organisational risks: Disruption to existing service-level agreements could severely impede the functioning of the Council. Timing: The current division between the Stability Programme Update and Summer Economic Statement poses a risk to the relevance of the Council’s work. Entering the Preventive Arm of the Stability and Growth Pact: Following Ireland’s exit from the EU-IMF programme of financial support on 15th of December 2013 and its achievement of a deficit below 3 per cent of GDP in 2015, it has now entered into the Preventive Arm of the Stability and Growth Pact. This has given more importance to new budgetary framework comprising greater surveillance (including that of the Fiscal Council) and a system of domestic and EU fiscal rules. Deeper analysis/research: A larger Secretariat gives scope for richer analysis, for making output more visible to relevant public bodies and the general public, for continuing to build the Fiscal Council’s reputation, and for developing long-term analysis of the public finances. European and domestic agenda: The Council could have a greater role in the European and domestic debate on fiscal rules, structures, and economic governance. Publish two Fiscal Assessment Reports, as well as a Pre-Budget Statement, every year; with Fiscal Assessment Reports to be produced within 6 weeks of each Budget and within 8 weeks of the Stability Programme Update. Report systematically on official forecasts. Continue to develop analytical approach to assessing the fiscal stance and compliance with the Domestic Budgetary Rule. Review each Fiscal Assessment Report and document changes/improvements for future reports. Finalise the benchmark projections prepared by the Secretariat as an input in the Council’s endorsement considerations. Document the Council’s approach to each endorsement exercise in each Fiscal Assessment Report including all relevant meetings, data and decisions. Provide an Endorsement Letter (or reasons for non endorsement) no later than five working days prior to each Budget and Stability Programme. Develop and refine short- and medium- term forecasting models. Review, on an ongoing basis, the Memorandum of Understanding with the Department of Finance. Publish its Annual Report and financial statements within one month of the Comptroller and Auditor General completing its audit of the financial statements, or within six months of the end of the financial year (whichever is earlier). Implement any recommendations following audit by the Comptroller and Auditor General. Review ongoing requirements for statutory bodies and update procedures as may be required. Publish dates of all Council meetings. Publish all formal interactions with Government. Respond to all queries (including parliamentary questions) in relation to Council activities. Ensure that the website is up to date and reflective of Council work (meetings, decisions, reports, presentations). External review of Council operations. Implement, as appropriate, the recommendations of the 2015 external peer review group, including initiating an external review of the Council’s operations in 2020 taking into account performance over the period since 2015. Ensure that reports are presented in a clear manner to the highest possible professional standards. Ensure that reports contain non-technical summaries. Ensure that queries on reports are responded to in a timely manner. Publish key analytical work undertaken in relation to its mandate outside of the biannual assessment reports. Seek to present such work at relevant conferences/seminars. Raise awareness on fiscal issues and activities of the Council outside of the Fiscal Assessment Report cycle. When invited, appear before Oireachtas Committees in relation to the Council’s work. Host media briefings prior to the publication of each Fiscal Assessment Report. Publish press briefings (including presentations). Organise a “Path for the Public Finances” conference every year, to bring focus to long-term public finance issues relevant for Ireland, with each year’s conference focussing on a particular theme. Participate in domestic and international conferences and seminars of relevance to the Council’s mandate. Respond in a timely manner to all queries on its activities. Make greater use of the Council’s website and social media accounts, to establish the Council as the authoritative source on fiscal policy and fiscal stance in Ireland. Further develop the Secretariat’s short-term (2 year) and medium-term (3–5-year) forecasting capabilities through training, recruitment and reviewing Benchmark projections. Document and publish its approaches to forecasting. Make key databases or links to data sources available on the Council’s website. Liaise with the Economic and Social Research Institute (ESRI) on its approach to modelling using COSMO (COre Structural MOdel for Ireland). Public Finances and Fiscal Rules. Ensure staff are appropriately trained and informed on all issues relating to the public finances and fiscal rules. Document clearly the Government’s compliance or non-compliance with the domestic Budgetary Rule. Further develop analysis of revisions to public finance projections relative to plans. Further develop analysis of budgetary one-offs. Further develop understanding of key drivers of public expenditure forecasts. Publish key tools used to assess compliance with the fiscal rules. Ongoing training for Secretariat where appropriate. Regular reviews of Secretariat output. Ensure that there are clear work plans and goals in place for staff. Liaise with service providers to ease administrative burden on staff (to include an annual review of any Service Level Agreements). Periodically meet with key stakeholders of the Council to hear their views on economic issues and work related to the Council. To include: Committees to Houses of the Oireachtas, Central Statistics Office, Department of Finance, Department of Public Expenditure and Reform, ESRI, private economic forecasting agencies, other international fiscal councils. The Budgetary Rule requires that the budgetary position of the general government is in balance or in surplus, or is moving at a satisfactory pace towards that position. The Council must also assess whether any non-compliance is a result of ‘exceptional circumstances’. This could mean a severe economic downturn and/or an unusual event outside the control of Government which may have a major impact on the budgetary position.